The most famous Pelican of them all. Of all the clubs affiliated to the SAAA over the decades, surely none had a more exotic name than the Scottish Pelicans? Formed in 1894, the name alone tells us a lot about the attitude to the sport at the time. Light hearted but almost certainly with a meaning for those who formed the club, they won 8 SAAA Championships between 1894 and 1896 inclusive. Downer was by far the most famous – he ran the ‘triple triple’ ie the 100 yards, 220 yards and 440 yards in three consecutive years. 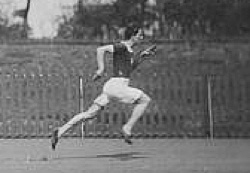 He ran initially, in 1893, for Edinburgh Harriers and then when the new club appeared on the scene, he turned out for them before he moved to Clydesdale Harriers and various other clubs. He eventually turned professional after receiving excessive expenses. Among the other founder members was Tom Scott of Langholm. 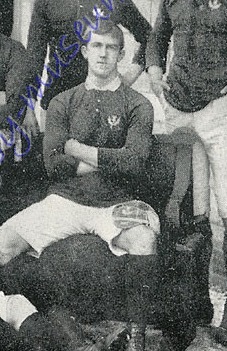 His father, William, was the club’s first captaimn and Tom was their first inernational rugby cap. Langholm incidentally once won 28 caps in the one afternoon – at the Hawick Sevens they won and each team member received four eg-cups on a stand! JK Ballantyne and W Lindsay Walker were also founder members . Edinburgh Harriers had an annual sports meeting at Powderhall and on 8th June, 1895, there were several athletes running under the Pelicans banner. In the 100 yards open flat handicap, there were 11 heats and A Bruce, W Pollock an1 JR Ballantyne all got through the first rouynd but only Ballantyne, who was second in the second heat, made it through to the final where he was unplaced. There were only two entries in the 100 yards for the Muir Cup – JG Dunbar and RA Bruce with Dunbar winning. The 440 yards handicap open handicap featured Pollock again and this time he was second in the heat and third in the final. Two years later there were no Pelicans to be seen in the sports. And that’s about all I can find about the Scottish Pelicans. There will be more when I get it, but that’s not saying it will be soon.